The perfect Instagram, Facebook, Pinterest, Twitter, Google Plus, Tumblr, Gmail, Yahoo Mail, Outlook, Weibo and Google Calendar app for your Mac - Pro Version. Tab for All Pro is just your solution which support all these popular website like Instagram, Facebook, Pinterest, Twitter, Google Plus, Tumblr, Gmail, Yahoo Mail, Outlook, Weibo and Google Calendar. 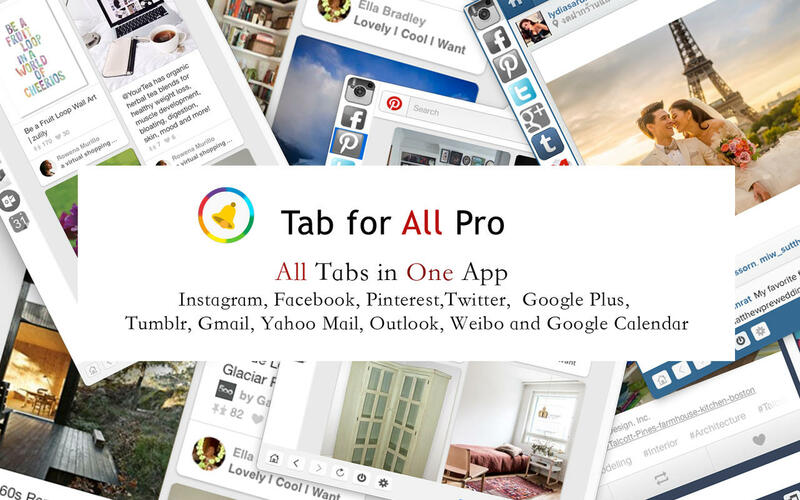 Tab for All Pro is new way to access your Instagram, Facebook, Pinterest, Twitter, Google Plus, Tumblr, Gmail, Yahoo Mail, Outlook, Weibo and Google Calendar. Doesn't have enough space for a menubar app? Not a problem. We introduce Tab for All Pro that will stick on edges of your screen. Access your Instagram, Facebook, Pinterest, Twitter, Google Plus, Tumblr, Gmail, Yahoo Mail, Outlook, Weibo and Google Calendar with "1 click" from your menubar, icon in menubar, Desktop mode with attachments, Popup notifications, Stealth mode, Full screen support and much more! 1. It is Convenient to access to Instagram, Facebook, Pinterest, Twitter, Google Plus, Tumblr, Gmail, Yahoo Mail, Outlook, Weibo and Google Calendar via your Mac's menu bar. Access your Instagram, Facebook, Pinterest, Twitter, Google Plus, Tumblr, Gmail, Yahoo Mail, Outlook, Weibo and Google Calendar with "1 click" from your menubar or you can via its customizable hot key. 2. New picture notifications with customizable audio alerts. When you've got an updates via a vivid menu bar icon we've made it really simple to know. 8. Auto hide Tab when inactive. 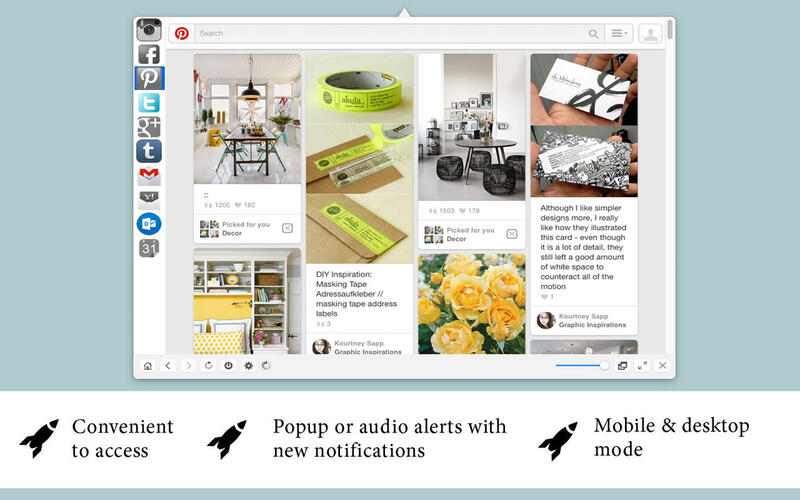 You'll soon be able to discover new notifications. When you receive new notifications the app's icon will be colored. Tab for All Pro is a 3rd party application for Instagram, Facebook, Pinterest, Twitter, Google Plus, Tumblr, Gmail, Yahoo Mail, Outlook, Weibo and Google Calendar and is in no way endorsed or affiliated with these companies.